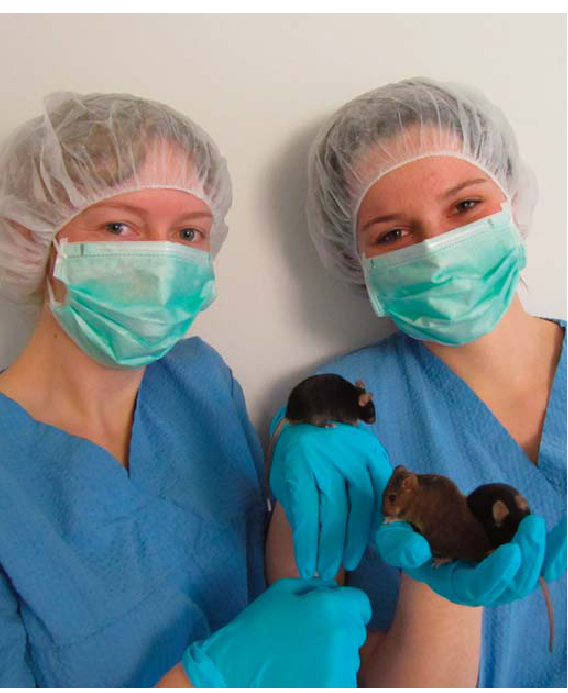 It’s in the responsibility of an animal caretaker research/clinics to take care and breed experimental animals in research institutions and assist in animal experiments. In animal clinics, animal caretakers take care of ill or injured pets and assist in medical interventions and treatments. During their dual vocational training, trainees attend two to three-week teaching blocks at the Berufsschule Ansbach/Außenstelle Triesdorf, each followed by a 4-6-week practical training at FLI. The apprenticeship is organized by the Chamber of Industry and Commerce (IHK) of Eastern Thuringia in Gera and normally takes 3 years (40 h/week). Showing excellent training results, the duration may be shortened. Trainees are remunerated according to the agreement TVA-L BBiG. After the completion of their vocational training, animal caretakers research/clinics can collaborate with and assist to our FLI scientists in research and research projects. development departments of pharmaceutical and chemical enterprises, in universities and research institutions. The vocational school in Ansbach/Triesdorf organizes extracurricular activities as well, e.g. excursions to the Wilhelma in Stuttgart, Nuremberg Zoo or the Wildlife Park in Bad Mergentheim. To celebrate the completion of the training, a common end-of-school trip is conducted (e.g. to Amsterdam).